The FJ Cruiser’s rock rails are an important part of the vehicle. 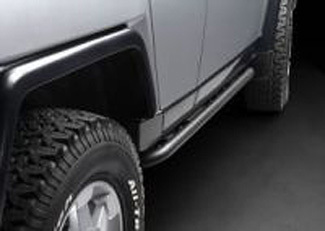 They are located along the rocker panels and offer both safety and style. They protect the bottom of the body of your FJ Cruiser. More importantly, they offer a place to step up or down when entering or exiting your FJ Cruiser. Without them, it would be a struggle for many passengers to get into the high standing FJ Cruiser. It would also put the body in harm's way, leaving it open to damage. Don’t settle for cheap aftermarket rock rails. Those are made to be universal, and rarely fit right when installed. Additionally, they often require modifications to your vehicle to install. The OEM rock rail is made to fit your FJ Cruiser exactly. They're OEM standards in both quality and fitment. On our site, you’ll find the OEM parts PT738-35091 and PT738-35090. When you shop Olathe Toyota Parts, you can get your OEM FJ Cruiser parts here at wholesale pricing. 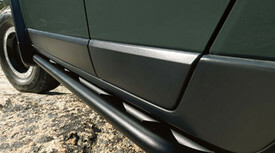 Get your OEM FJ Cruiser rock rails now.